Today is Moms’ Equal Pay Day. Yes, the belated Mother’s Day gift no woman wants — the day in 2016 when mothers earn what fathers earned last year. The gap between what moms earn and what dads earn may surprise you: mothers who work full-time outside of the home earn 73 percent of what fathers earn. And when compared to white, non-Hispanic men, African American mothers earn just 53 percent and Latina moms earn 47 percent. The gap is also wider for single moms. The wage gap between mothers and fathers occurs in every state. At American Women, we’ve been listening to what women from across the country have to say about the struggles they face. Women — and moms — want policy solutions that actually help their families get ahead. In our December 2015 poll we found that 8 of 10 moms would support a candidate who supports equal pay for equal work. 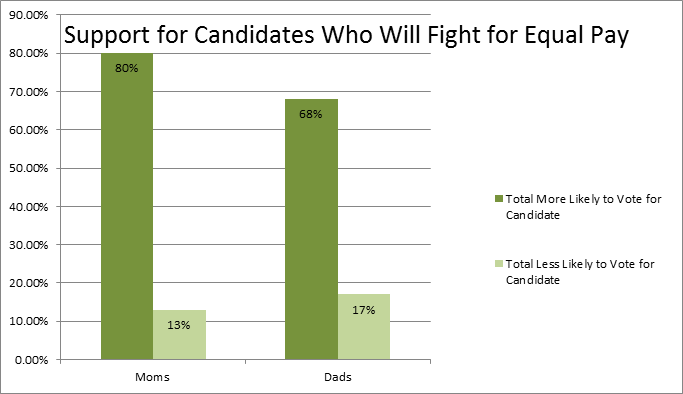 And nearly 7 out of 10 dads would support the same candidates. They are not alone. Voters are demanding policymakers take action to close the gender wage gap. Poll after poll after poll shows this is a top concern among key voting blocs including unmarried women and millennial women. So as Congress, state legislatures, policymakers, and candidates look ahead and decide their policy priorities for the rest of 2016, maybe it’s time to listen to your mother and end gender discrimination in pay.